How do we know if a population is evolving? 1. The traits within a population vary from individual to individual. 2. The variation must be heritable in some manner; not controlled completely by the environment. 4. Individuals with more favorable traits are better adapted to the environment, and therefore pass more genetic information to the next generation. All four of Darwin’s postulates can be confirmed within the firemouth cichlid population, which would confirm that evolution is occurring within the firemouth population. In fact, studies have shown that evolution is taking place at a very high rate in many cichlid populations, especially in the firemouth cichlids (7, 8, 9). Darwin’s second postulate, that variation is heritable, can be observed by the increase of various “dominant” traits over successive generations. 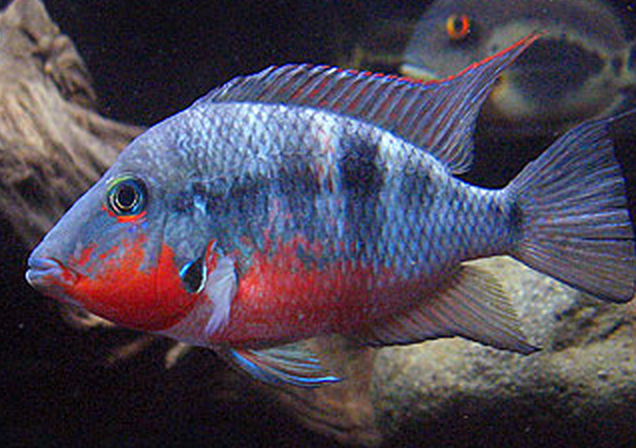 In firemouth cichlids, most of this is due to competition between males and sexual selection by the females (2, 7, 8). The third postulate that Darwin proposed was that there are differing survival and reproductive rates among the individuals within the population. This has been confirmed by various studies done on the long-term evolutionary change in coloration due to natural and sexual selection in firemouth cichlids (1, 4, 8, 9). Darwin’s fourth postulate is essentially a confirmation of the effects of the first three postulates. Based on the previous three postulates, scientists are able to document heritable variation within the population and differential mating success and survival. From these observations, the evolutionary change of the firemouth cichlid population can be determined. 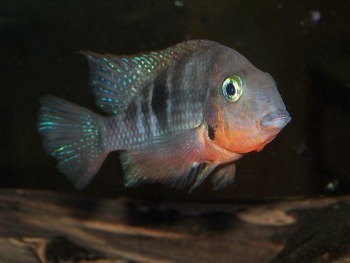 The firemouth cichlid population is a good example of evolution in action. With a confirmation of all four of Darwin’s postulates, the factual nature of firemouth evolutionary change is impossible to deny. These changes are primarily due to male-male competition (via fighting), sexual selection by the females, and various other behavioral, morphological and molecular changes. (1) Baerends, G. P., and J. M. Baerends-Van Roon. 1950. An Introduction to the Study of the Ethology of the Cichlid Fishes. Behaviour. Supplement. (2) Beeching, S. C., and Pike, R. E. 2010. Ontogenetic Color Change in the Firemouth Cichlid, Thorichthys Meeki. The American Society of Ichthyologists and Herpetologists. (3) Chen, C., and Fernald, R. D. 2011. Visual Information Alone Changes Behavior and Physiology during Social Interactions in a Cichlid Fish (Astatotilapia burtoni). PLoS ONE. (4) Dijkstra, P. D., and Groothuis, T. G. G. 2011. Male-Male Competition as a Force in Evolutionary Diversification: Evidence in Haplochromine Cichlid Fish. International Journal of Evolutionary Biology. (5) Enquist, M. Leimar, O., Ljungberg, T., Mallner, Y., and Segerdhal, N. 1990. A test of the sequential assessment game:fighting in the cichlid fish Nannacara annomala. The Association for the Study of Animal Behavior. (7) Kodric-Brown, A. 1998. Sexual Dichromatism and Temporary Color Changes in the Reproduction of Fishes. American Zoology. (8) Maan, M. E., Hofker, K. D., van Alphen, J. J. M., and Seehausen, Ole. 2006. Sensory Drive in Cichlid Speciation. The American Naturalist. (9) Nagl S., Tichy, H., Mayer, W. E.,Takezaki, N., Takahata, N. and Klein, J. 2000. The origin and age of haplochromine shes in Lake Victoria, East Africa. The Royal Society. (10) Neil, S. J. 1984. Color Pattern Variability and Behavioral Correlates in the Firemouth Cichlid, Cichlasoma meeki. Copeia. (11) Sugawara, T. Terai, Y., and Okada, N. 2002. Natural Selection of the Rhodopsin Gene During the Adaptive Radiation of East African Great Lakes Cichlid Fishes. Society for Molecular Biology and Evolution.